Do I have to report rental income if the property's making a loss? If your rental income is less than the amounts above you still have to report it but on form P810. 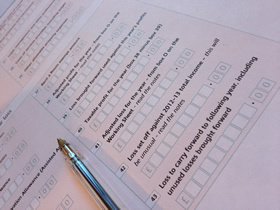 When you complete your self assessment return you’ll declare all your income, i.e. rent received from your property and you’ll also declare all your allowable expenses. If you’ve made a profit, i.e. rents received are more than your allowable expenses, this will be added to all your other taxable income and taxed accordingly. If you’ve made a loss, i.e. your allowable expenses are more than the rents received, there’ll be no profits to add and therefore no additional tax to pay. You may therefore ask: what’s the use of reporting a loss if there’s no tax to pay anyway. Well listen carefully and I’ll tell you. If you’ve made losses on your rental property you can use these losses to offset future profits on this or any other rental property you might own. Losses can accumulate so if you make a loss of (say) £3,000 in year 1, £1,000 in year 2 and £500 in year 3, when you make a profit of £6,000 in year 4 you can offset the £4,500 of accumulated losses so you’ll only be taxed on £1,500. It’s also worth knowing that losses can be carried forward indefinitely so even if it’s four, five or six year before you finally start turning a profit imagine the amount of losses you’ll have ready to offset against these profits and reduce or even cancel out your tax bill. You don’t even have to use the losses all at once. You can for example use up just enough of the loss to take your taxable income down to your personal allowance for the year. At that level you’ll have no tax to pay and you’ll still have the remainder of the loss to carry forward to next year. There are time limits for reporting the losses so you declare them as soon as possible. You may well have a problem trying to offset losses for the past 10 years if HMRC have never heard of then till now. So people, please don’t shoot yourselves in the foot by not reporting losses on your rental income as there are valuable tax savings to be had from them.